You wake up each morning for your daily walk on the beach. It’s flat, a long curve that runs for two-and-a-half miles, ending on either end in tree-covered cliffs. Your condo is just two blocks or so away. You’re renting, trying out the community before you commit to buying a property. It’s a one-bedroom condo in a gated complex, a nice mix of friendly expats and locals who congregate in the pool. You pay $500 a month during “low” season December through February and $700 the rest of the year. It’s fully furnished. A similar unit to this one with two bedrooms—in another part of the community—is listed for sale at $62,000. Back at the beach, surfers, seagulls, and fellow beachcombers are your only company. The tourist crowd tends to sleep in. Your walk finished, you’re sitting on a bench knocking the volcanic sand from your shoes when you hear the telltale squawk of scarlet macaws (they’re almost in mating pairs) in the tree above you. They’re increasingly found on this stretch of coast thanks to a serious conservation effort. Then you head over to the main drag for a coffee. The local gelato shop, run by Italian expats, has a little window from which a seemingly endless stream of steaming tiny espresso cups issue forth. The proprietor and his friends are already animatedly discussing the news of the day. The air is cool—comfortable for a walk—but it’ll soon warm up. You run into a friend walking her dog and make dinner plans. It’s Wednesday so there’s half-price sushi at your favorite Japanese place. As for filling the rest of the day, you have some tough choices ahead. There’s volunteering to teach kids English at the new community center, you could go hiking in a pristine rain forest just down the road filled with capuchin and howler monkeys, sloths, and toucans…sport fishing charters head out early from the nearby marina…and the surf is up just about every day if you want to take a lesson. 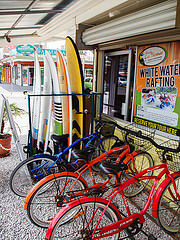 Jaco offers a lively vibe, great restaurant scene, and thriving nightlife. 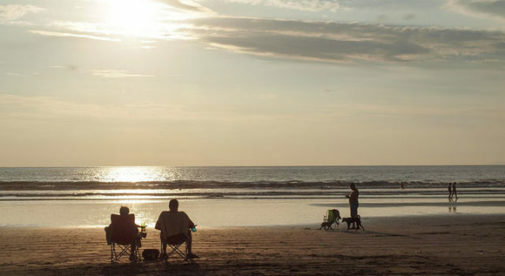 You’re in Jaco, a popular beach resort on Costa Rica’s Central Pacific coast. You have the services and amenities of a good-sized town. And though popular with tourists, it retains a laidback vibe and has a close-knit core expat community of a dozen nationalities. Jaco is not a small fishing village. It’s not set in the jungle. The beaches do have umbrellas and chairs and waiters offering food and drink. There are some tall condos on the shore. And all-inclusive resorts, though small, are there, too. It’s not a tiny undiscovered beach town. But for the expats who live in Jaco, it’s exactly what they’re looking for. A lively vibe, great restaurant scene, and thriving nightlife are on offer…it’s a walkable town with plenty of opportunities for fun and work in the community. And you’re centrally located, with quick access to other, quieter beach areas thanks to a well-maintained highway. Services in the capital, San Jose, like the country’s best medical care, top shopping, and international airport, are just an hour or so away on a modern highway. Plus, thanks to its long history as a tourism destination, English is commonly spoken. Because lots of people want to be in Jaco, that means there’s a strong real estate market. It’s recovered from the 2008 crash and construction has started again. But prices on the water are still reasonable, a fraction of what you’d pay for similar properties on the beach in the U.S.—as a former Florida resident I should know. Here living on the water is not just possible, it’s affordable. A two-bedroom condo in a beachfront building, with the glittering Pacific set before your terrace was recently listed for $195,000. You get a community pool and tropically landscaped grounds. That’s a typical price for the location for one of the smaller condo complexes. Go high-end in one of the newly-constructed buildings with luxury finishes and resort-style amenities and expect to pay about $300,000 and up. And, by the way, unlike most coastal areas in the country, you get fully titled property right on the beach. Very reasonable for the location and the types of property—but go a bit inland and it gets even more affordable. There you have absolute bargains, including homes in quiet residential neighborhoods away from the bustle of the beach strip but still walking distance to the water. For $185,000 you get a two-bedroom home with a pool, and it was just remodeled. A two-bedroom home on the south side—a quick bike ride to the shopping and restaurants downtown but just a block from the water— is available for $800 a month, fully furnished.